I am 68 inches tall. Like most humans, my legs are nearly half my height (note the red slash mark showing the length of my leg, when doubled it lands at my neck). Patty - (Patterson film) her legs were 1/3 of her height. (note the same leg length to body comparisons proportions as orangutan). The apes were arboreal and evolved for much tree climbing. We, however, were proportioned to walk across plains expediently without disruption. Our proportions put more emphasis on the leg length. The large barrel chest of the Bigfoot suggests they were adapted for high altitudes and gaining adequate oxygen. This gene for high altitude adaptations shows up in the Sherpa of the Himalayas who have some Denisovans DNA and passed on from that high altitude lineage. We talk about long ape arms on Bigfoot, and they don't hang terribly long on the leg, but given the length of the body, those arms hang past the lengthy body. Could Patty (upper right photo still taken from the Patterson film of 1967) be a suit? Well, can you make a suit or walk in a suit with these proportions? With this length of body, your head would be inside the suit. If I had her proportions and my legs were 1/3 of my height, instead of 68 inches, I'd be 96! (8 feet!). In fact, I probably exceed Patty's inseam length, a rather shocking thing to realize. If her legs are one third of her height as they do appear on the film and say she was 7 feet tall, her inseam would be shorter compared my Bigfoot proportion of 8 feet tall. If my hunch that Bigfoot is really a Denisovan is true, then the reason for the proportions make sense. For apes, tree climbing is more critical than walking on two legs. The body length and arm length for reach is more critical than leg length. For us, we needed to walk across plains bipedally. If Denisovans were acclimated for high altitudes (as DNA shows), then the ability to tolerate harsh weather, hair covering, and being able to go on all fours up mountainsides is a perfectly expected adaptation. Even today, people report BFs going on all fours, up hillsides and across open areas where they might be seen if they ran upright. They can launch themselves on powerful legs to leap long distances and cover ground fast. This would also make for a wider hip, unbelievably strong lower body, and hip flexibility. If one looks at Patty, we can agree, her hips are wide, her muscular in the lower half is exceptional, especially her glut muscles in the rear. But, if were to observe a Bigfoot's DNA, their percentage might be quite substantial, as their mating with humans likely happened long ago, so they would be more (archaic man, perhaps Denisovan and perhaps part Neanderthal) but only perhaps 4% Homo sapiens in some of their population, from interbreeding tens of thousands of years ago. What do we know of Neanderthal's proportions? He had a barrel chest, long arms, shorter legs, longer body. 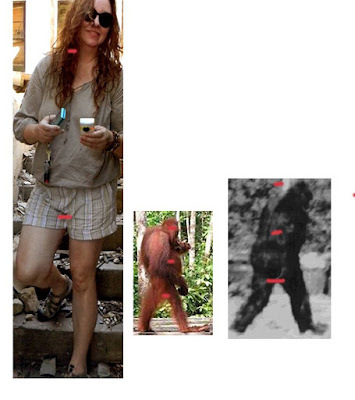 Perhaps one of the most telling features of Bigfoot that can help us determine one in photos or video is the entire body and its proportions. This has become one of the criteria I use when evaluating if a video is capturing a costumed person or a possible true Bigfoot. This comparison is to showcase the fact that their form of man and our form of man adapted for different regions and purposes. Their proportions seem unusual to us because we are used to Homo sapiens proportions. Their very build is made for more treacherous landscapes. There is no doubt at all that they are man and what we usually refer to as archaic for the simple reason that we thought they went extinct. The comparison with proportions in the ape family is significant in that it shows that these people were built for climbing environments that were important for their adaptation. We ourselves would have the same proportions today if we did not take off across the plains and less treacherous landscapes.